Today Portugal issued 10-year bonds for the first time since it received a bailout from the EU and the IMF in 2011. Average yield of today's issuance stands at 3.58 percent. 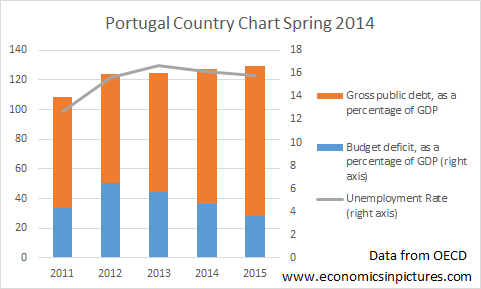 In May 2014 the bailout ends and with these yields Portugal may not need an extension. The chart of this post shows government debt, government deficit (inverted) and unemployment rate of Portugal from the start of the bailout until 2015 (projections for 2014 and 2015). While the budget deficit has decreased in 2013 versus 2012, the rate of unemployment remains relatively high. The government debt is also expected to keep rising to almost 130 percent in 2015.